I love spending time with my boys, one of favorite things to do is play games together. We have a weekly family night and during snow days we always bust out the game chest. Last week Quinn was feeling down. The kids at preschool made fun of his little hat that he was so proud of and it really upset him. My little man is sensitive and this broke his heart. On the way home I stopped and got him lunch to cheer him up. When we sat down to eat I put in our new Inside Out movie and I opened up our game chest. His entire face lit up when he realized the two of us were going to play games together. Better yet it was just me him so he chances of winning were pretty good! 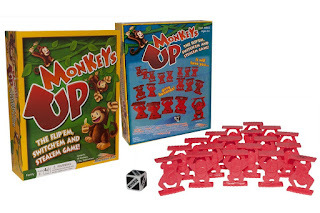 I myself was excited because I just got the all new game Monkeys Up from RoosterFin. Monkeys Up is a game that will have you going bananas! Players compete to get the best score by flipping, switching, and stealing monkeys. Each monkey has a value hidden under its feet that is only revealed when flipped. Victory will come to the player who switches, steals, and flips the best. You will find yourself laughing head over heels until all of your monkeys are up!